Verizon is an industry-leading telecommunications company and the second-largest in the world. 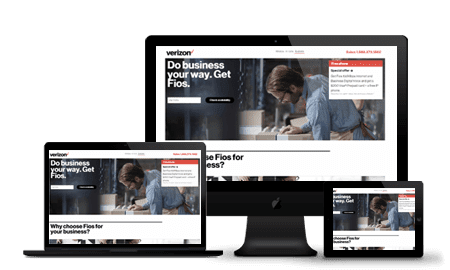 The Verizon Fios subsidiary offers a bundled internet and VoIP service that runs on a fiber-optic network. Their business digital phone (VoIP) and internet packages work best for small to mid-size businesses that want beneficial call management features and multiple lines. Verizon offers relatively good prices when compared with other VoIP companies. Keep in mind that there is a $99 setup fee with a two-year contract and a $149.99 fee with a month-to-month plan. You will get the best deal if you bundle the Business Digital Voice VoIP with Verizon Fios, a fiber-optic internet service. Note that the below plans are the monthly prices if you have a two-year agreement. This plan is $35 and is intended for smaller businesses, the basic Business Digital Voice package supports between 1 to 10 VoIP lines and includes all of the 30+ features. For $84.99, business owners can save by bundling the 75 Mbps Fios internet with the VoIP service. This package is best if you only expect 1 to 4 users and moderate downloading. At $114.99, the 150 Mbps bundle supports 5 to 10 users and is the best option for occasional video conferencing and file sharing. All the standard VoIP features are included. For $189.99, this plan is intended for 11 to 20 users. The 300 Mbps plan can support large data transfers between multiple devices. You also have the option to add Fios TV for just $10 per month. For $219.99, this plan is perfect for medium-size businesses who need their data backed up and protected. Over 20 users are supported on this plan. At 940 Mbps for the price of $219.99, this is the fastest plan that Verizon has to offer. It’s perfect for instantaneous downloads and providing customers ultra-fast service. You get all the functionality of the 500 Mbps plan paired with extra bandwidth. Verizon’s Business Digital Voice has over 30 powerful calling features including an auto attendant, hunt group, push to talk, personal phone directly, and do not disturb. What’s the importance of each of these features? When you call in, your customers can select who they want to talk to by pressing a number on their keypad. This feature transfers the caller to another phone if the person they originally call doesn’t pick up. With this tool, you can automatically reject certain numbers such as telemarketers. Screening calls can potentially increase employee productivity. Each phone has a list of the most frequently called phone numbers. This tool makes it easier to place calls quickly. When you don’t want to be bothered, do not disturb is a must-have. Keep you’re phone from ringing when you’re in the middle of a meeting. You can take your business calls on the go with either the Android or Apple mobile app. This comes included with each package. Whenever you receive a voicemail, you’ll receive a WAV audio file in your email. This makes it super simple to listen to your voicemail while you’re not at the office. If the power goes out, you can set a phone number that the call will forward to. This keeps you from missing important phone calls and possibly losing customers. Before going live, you need to set up a Yealink phone, the Business Digital Voice mobile client, and an analog telephone adapter (ATA). While Verizon does have training tutorials, it does take a bit of technical skill to set these devices up. Verizon also hosts live webinars, so you can talk to a trainer directly. Once the hardware is ready, management can configure and monitor the VoIP services through the “my account” administration portal. End users should follow the “my account portal” link. While Verizon doesn’t have 24/7 support, you can reach customer service on various channels, such as by phone and live chat. Helpful information can also be found in their FAQ section, forums, and more. You can contact Verizon by phone during the week and weekends. Support is available through live chat. There are video tutorials to help you get stared. Verizon has a FAQ page just for their Business Digital Voice Service. You can interact with fellow business owner’s on Verizon’s Community Forum. There’s also a blog titled Verizon Business Markets. Given that Verizon dominates the telecommunications industry, you can’t go wrong with their Business Digital Voice VoIP service. For a competitive price, you get some of the same features large corporations use daily – music on hold, call waiting, unified messaging, and many more. Not only that, but Verizon has thorough video tutorials to simplify the onboarding process. With this service, you get a powerful VoIP system for a fraction of the price you’d pay at some of Verizon’s competitors. Ethan is an avid freelancer writer with a professional background in accounting. He enjoys covering all sorts of topics ranging from internet marketing to personal finance.